Okay, I have a lot to get caught up on after a busy weekend filled with golf but lacking wi-fi in my hotel room. 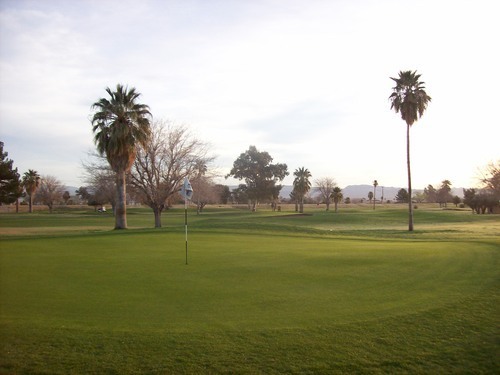 I ended up playing six rounds over the long Presidents Day weekend, so I’ll split the reviews up two courses at a time and post the stories throughout this week. I made my first visit to the Tri-State area where California, Arizona and Nevada all intersect. 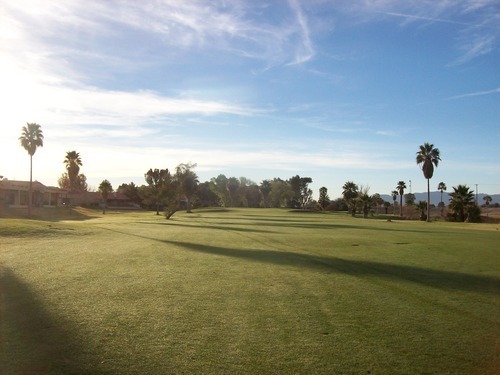 The main “excuse” for the trip was to play a couple of California courses I had left on my SoCal list (the final two on that list, in fact!!!). 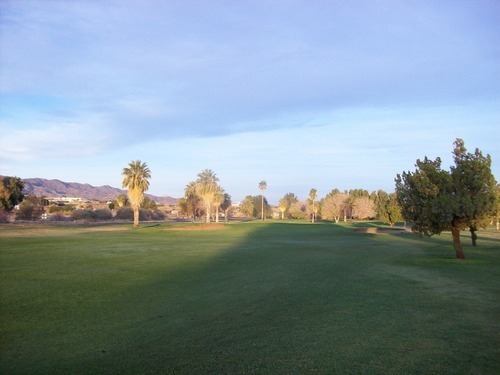 I also wanted to check out some golf in and around the Laughlin area. I could have left the night before and drove most of the way here, but I wanted to save money on a hotel room and either way I still would have had to get up early Saturday morning. So I left my house around 2:00 in the morning and made the four-hour trek to Needles. 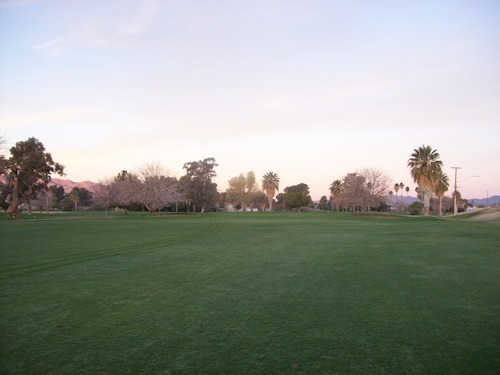 I wanted to get out and around the golf course as early as possible, so I figured I’d try and beat the crowd. Well, the “crowd” was me and a couple other dudes, but the pro shop was already open and I got checked in. The price was $45 with a cart and I went off first by myself as soon as it was light enough to see. 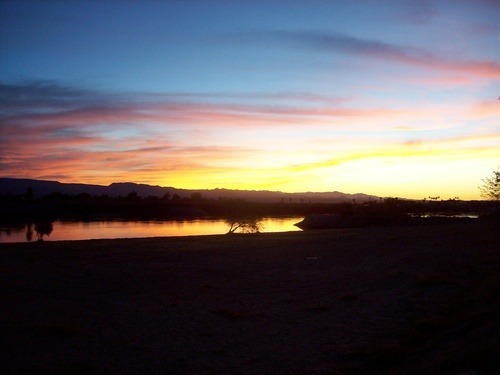 Pace was not an issue as I zipped around quickly on a beautiful morning along the western bank of the Colorado River. 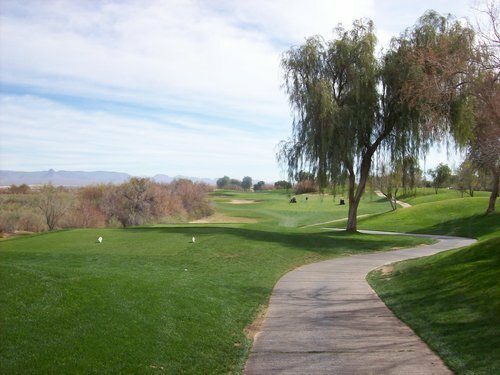 Though the course is right next to the river, no parts other than the clubhouse are right along the water’s edge (as the name would imply). Speaking of the name, this used to just be Needles Municipal Golf Course, and that will tell you a lot about what to expect from it. I’m not sure when they changed over to Rivers Edge (no apostrophe) but I guess it’s a more appealing name, though it may tease you a bit into thinking parts of the course actually play along the river’s edge. 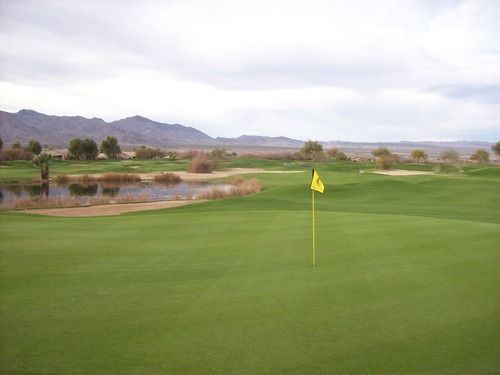 The course itself is pretty straightforward with a traditional design. 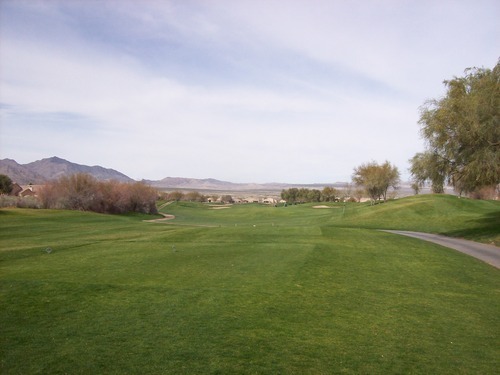 The terrain is very flat and some trees line the fairways, but they are relatively sparse. Overall, the layout is pretty forgiving from tee to green. The greens themselves are mostly pretty simple, as well, so it doesn’t present a ton of challenge. 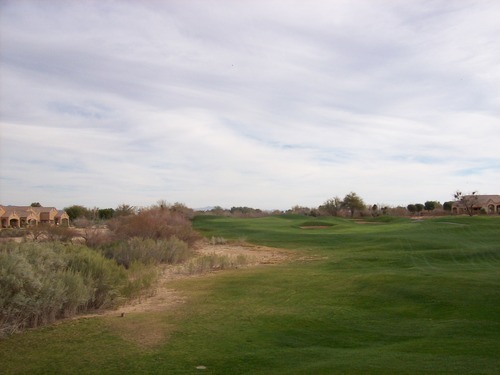 That said, it still makes you work with some longer holes, a few small hazards in play and some doglegs. 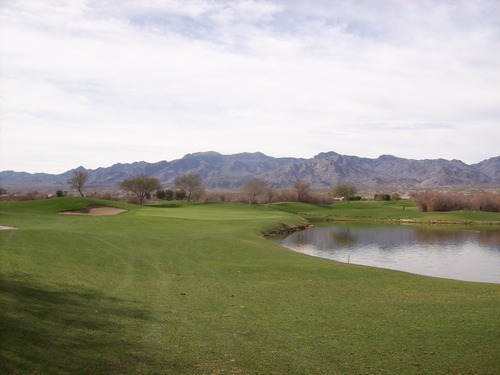 The most notable thing about the Rivers Edge layout is the fact that both the 9th and 18th holes are par-3s. I can’t remember playing another course with that set-up. 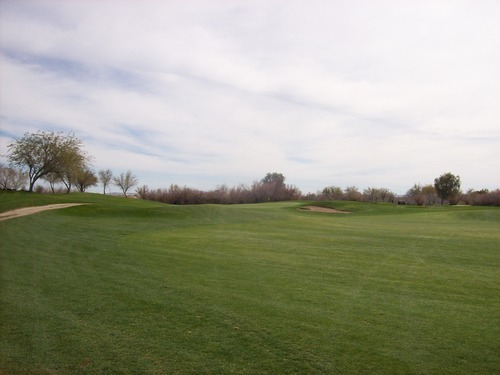 In addition, the 10th is a par-3, which is also uncommon. 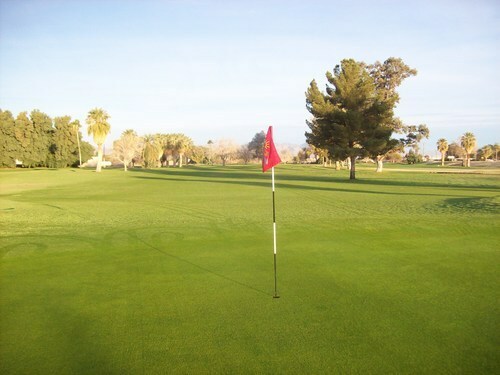 The course was actually in pretty decent condition for winter and that was a very pleasant surprise to make the round a little more enjoyable. I anticipated dry/thin conditions like I’ve been seeing at most other comparable courses lately. 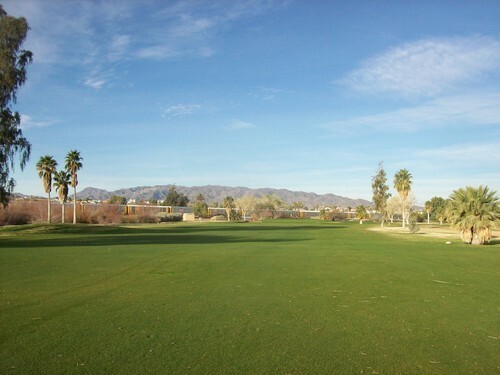 The tee boxes and fairways were pretty green and mostly good. There were many patches of clovers (no lucky four-leafers I could find, though) growing throughout the course. 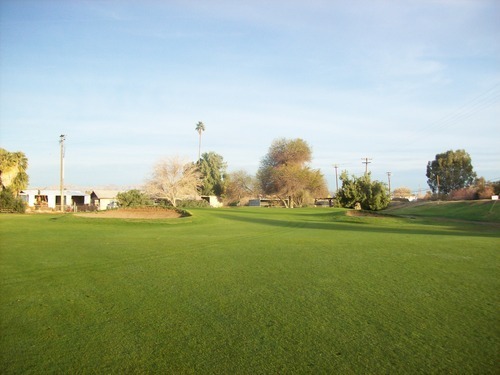 The rough was dormant and brown, but shaved down so not much of a factor. 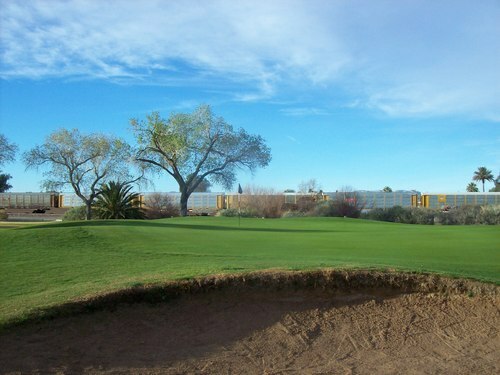 I was in a few bunkers and they were okay with coarse damp sand. The greens looked good with lush grass, but they were very shaggy and super slow. 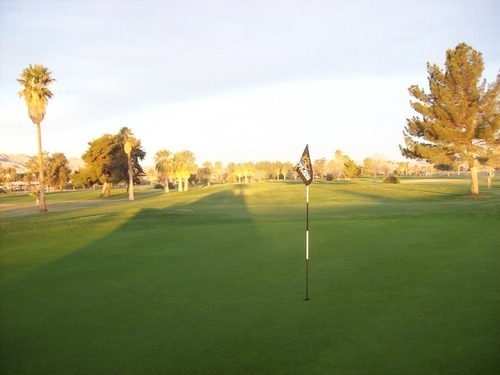 Rivers Edge is a solid course with a basic layout, so it’s about what you’d expect from an old muni located in remote Needles. 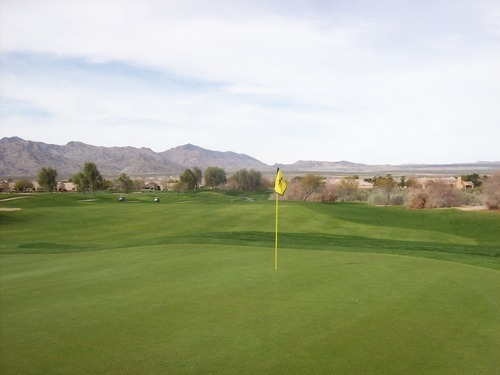 It’s not worth going too far out of your way for (unless you are crazy like me), but it’s a decent locals’ course and not a bad place to stop for a quick round to break up your drive along the I-40. After my round, I enjoyed a relaxed breakfast at the Wagon Wheel Restaurant in Needles, which has a rustic old school “Route 66” vibe like so many other things around this town. The diner food was about as good as you normally get at these places. 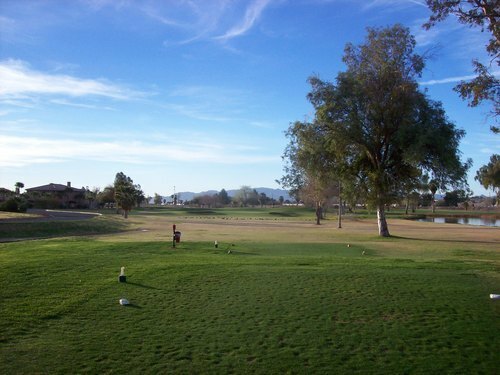 Originally, I had a 1:08 tee time to get a reasonable twilight rate of $65 (compared to $95 in the morning). However, I knew this course uses a “dynamic pricing” model so prices could change at the last minute. I found an 11:18 hot deal on GolfNow for $59 and that worked out better. 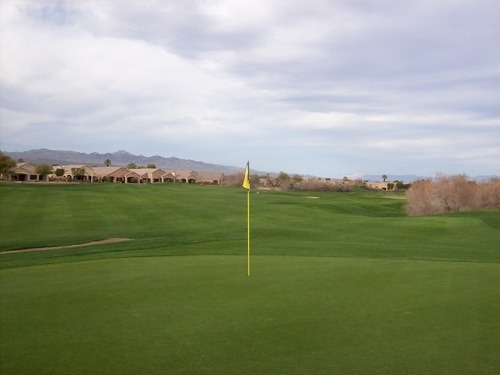 I was able to call the course to cancel my original reservation and I booked the earlier time at a better price. 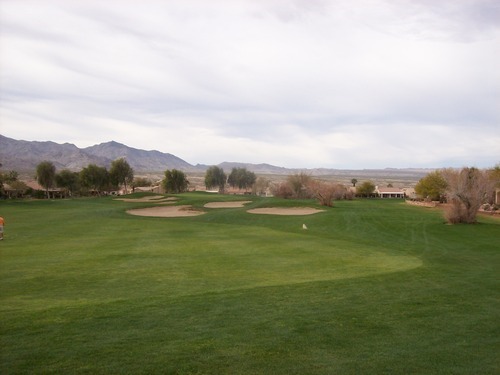 Things didn’t go so smoothly when booking at Mojave’s “sister” course, Huukan, for my Sunday round, but more on that when I write that review. 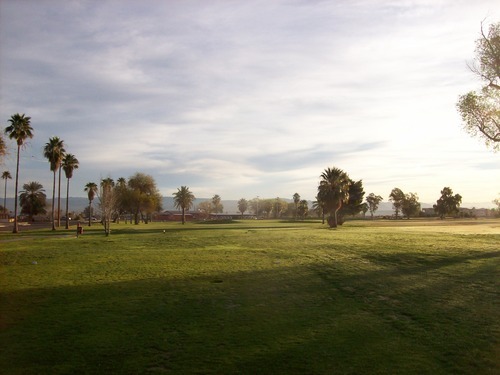 Both courses are owned by the tribe that owns the Avi Resort & Casino and let’s just say I was less than impressed with the management at either facility. The staff at Mojave seemed disinterested and disorganized. I didn’t have a specific run-in, but it was just a general negative vibe I got from everyone there. Admittedly, I was in a bad mood by the time I arrived after trying to deal with Huukan beforehand. Anyway, they ended up putting me with a different group and we went off around 11:30. The course was very busy and the pace seemed slow at times, but we still finished in about 4.5 hours. 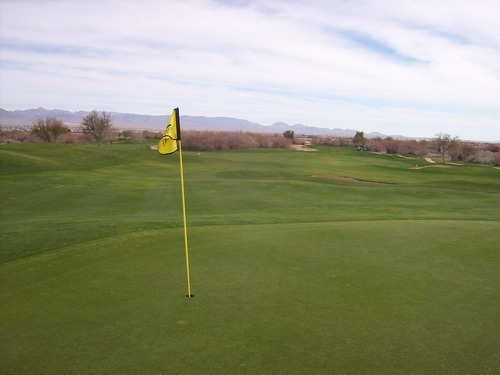 Any issues with the service were made up for by the course itself, which I really liked. 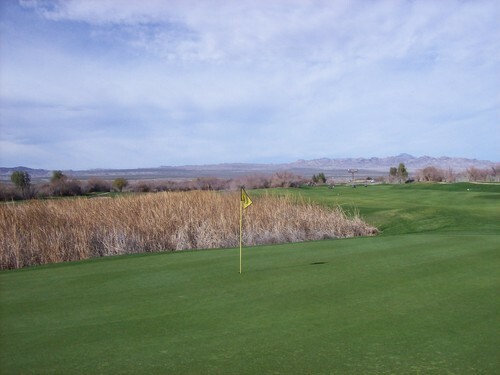 Mojave Resort was designed by the Schmidt-Curley team. 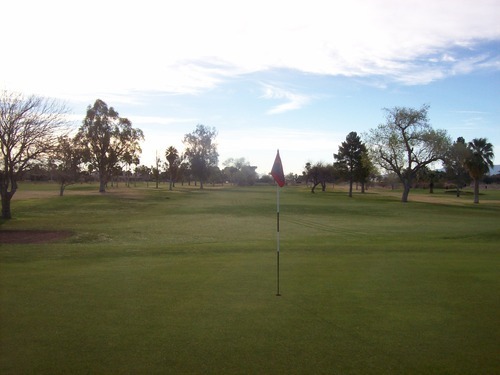 One of their other notable courses I’ve played is Goose Creek here in Southern California. I didn’t really know that going into Mojave, but after a few holes I had to look it up because I was curious. 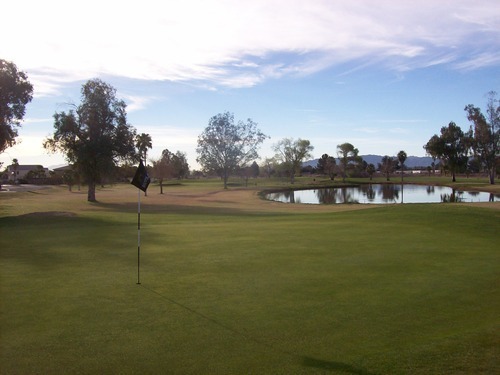 Throughout much of the front nine, this course looks and feels A LOT like Goose Creek. I just played there a few weeks ago, so it was extra fresh on my mind. 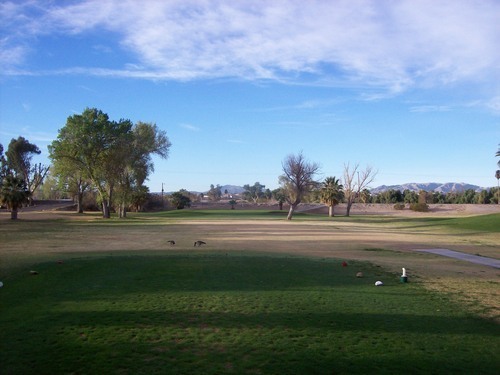 Replace some of the Goose’s unique bamboo patches and trees with more rugged desert brush and you have Mojave Resort. I mean this in a good way because I love Goose Creek. It was just kind of interesting how eerily similar this felt at times. 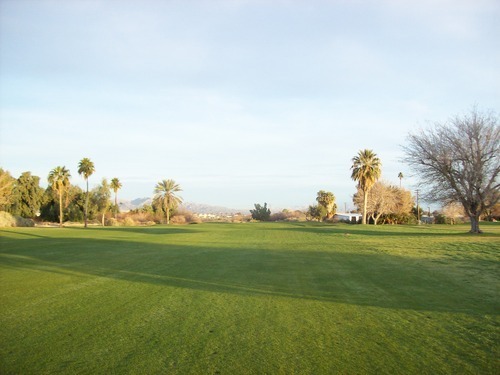 The back nine is a bit of a different story as more water comes into play and you get less of the grown-out reeds and native areas. Personally, I like when courses let the reeds and native grasses grow out in certain hazards. Sure, you might lose more balls, but it looks more interesting than when it’s just cut down to nothing. I’ve had some disagreements with friends on this issue, but as someone who enjoys the visual presentation of a course as well as the design, I’m firm in my stance. 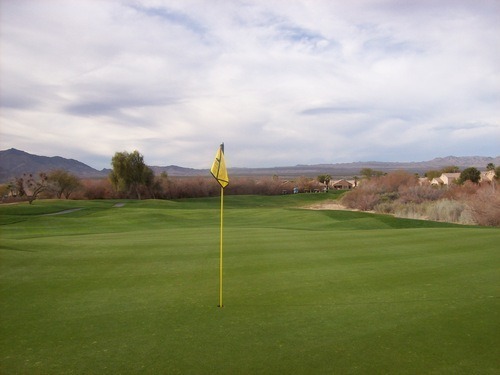 Mojave Resort features many memorable holes and the par-3s are all especially strong. Above all else, the finishing stretch of 16-18 on this course is particularly great. 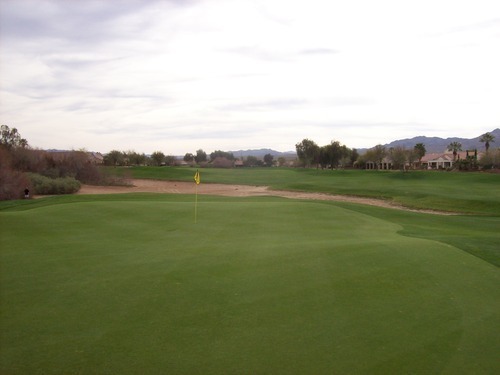 The 16th is a short par-4 that is potentially reachable for some long hitters. Water runs all along the right to force some risk/reward decisions. 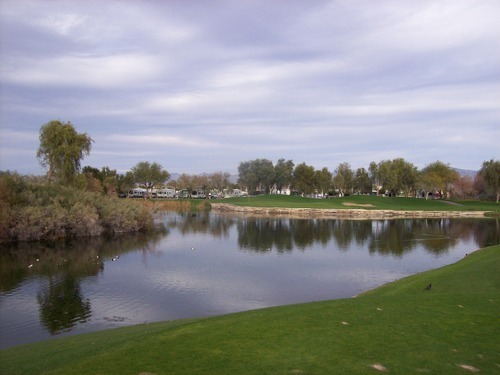 The 17th hole is a signature par-3 directly over water and not too much room for error. Lastly, the 18th is fantastic. 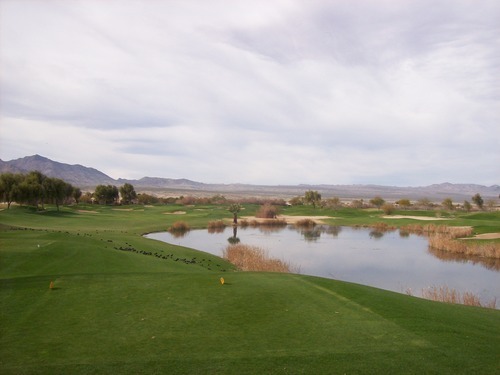 Known as “Double Cross,” it requires two shots over the water to get safely to the green. It’s a similar philosophy, but a very different execution than the 18th at Goose Creek. 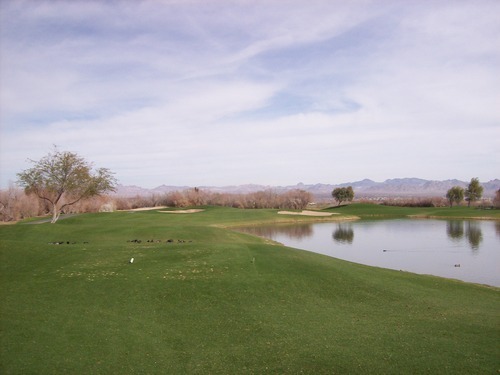 Water runs across and to the right for your tee shot, tempting you to bite off as much as you can on your drive. 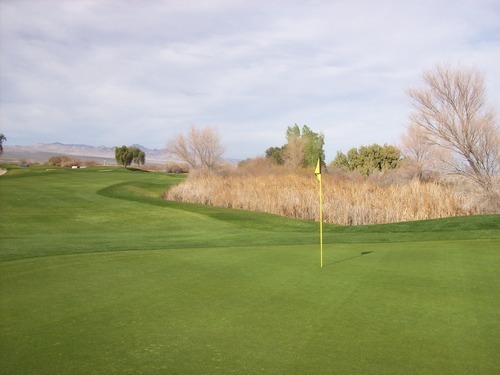 Then the approach is directly over the water to a well-protected green. 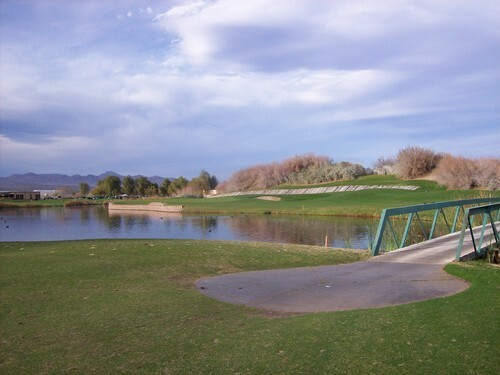 A rock wall along the water’s edge, a cool-looking bridge and some railroad ties along the cart path behind the hole provide distinctive aesthetic touches for the course’s unique, challenging and beautiful finishing hole. 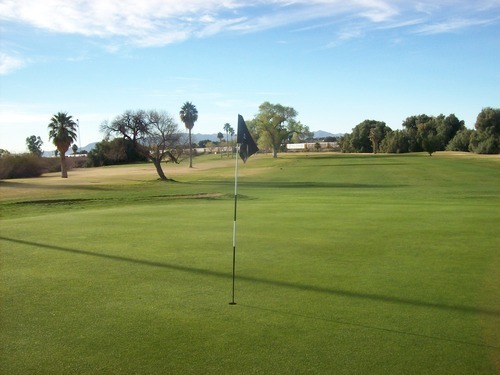 The course was in great overall condition, as well. 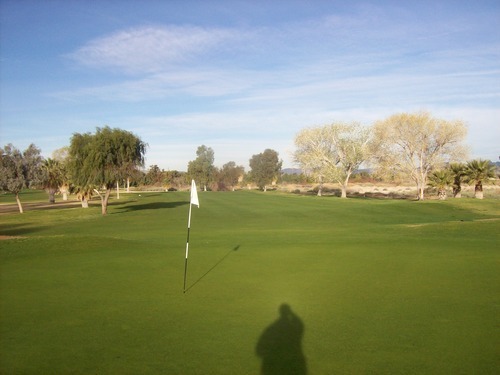 The fairways were a little thin in places, but pretty green and looking nice. The rough was pretty lush throughout, other than along the water hazards where the ducks, geese and coots have eaten all the seed and left behind their “presents” behind. 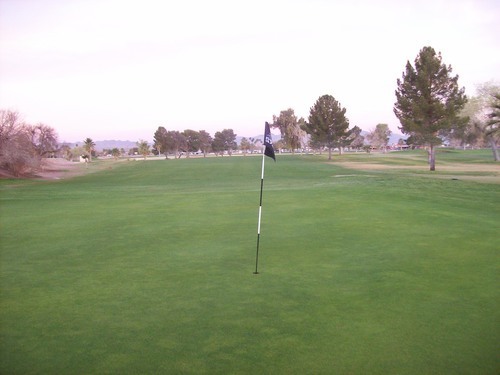 The greens were good and rolling smooth at medium speeds. 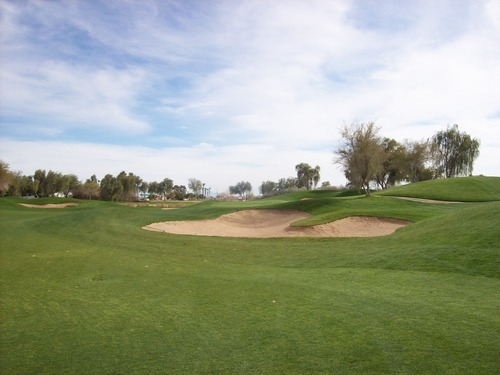 The bunkers had some small pebbles, but the sand consistency was good. 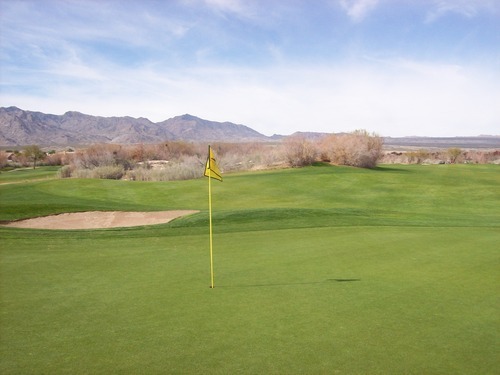 Overall, Mojave Resort is a great course. 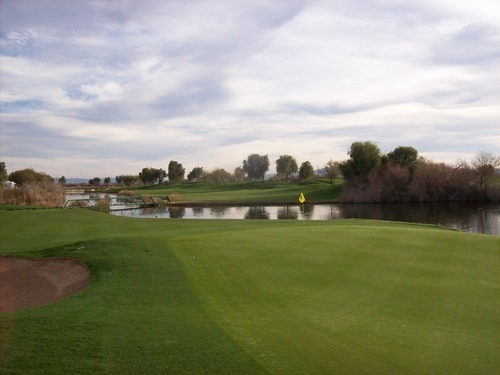 If you like the design of Goose Creek, you should like this one as well. 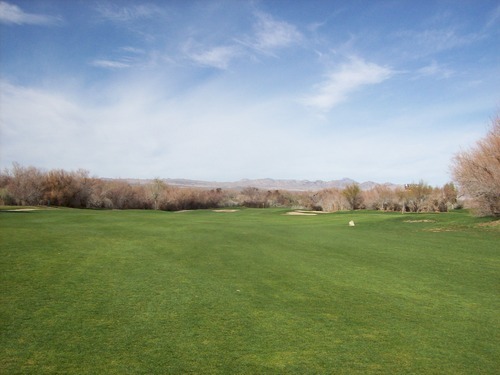 Though I didn’t get to play every course around the Laughlin/Bullhead City area this weekend, I played a good chunk and I’m confident in saying Mojave Resort is clearly among the top two behind Laughlin Ranch.